If anyone had asked me what it meant a few weeks ago, I'd have shrugged my shoulders. 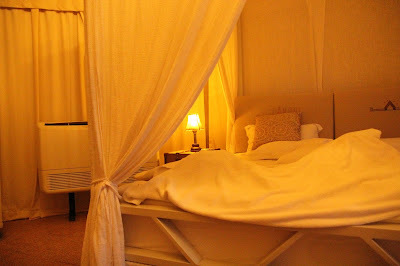 But here we were, in the middle of a glamping holiday. 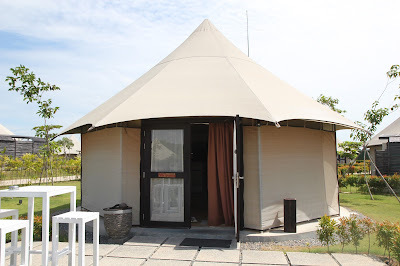 Glamping refers to 'glamorous camping' -- you have a tent to camp in, but it's wayyyyy cooler than a regular tent. 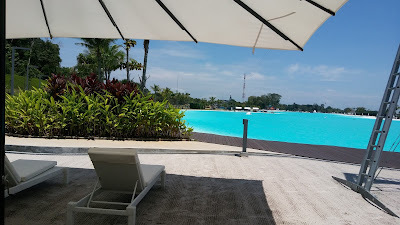 Whenever my parents visit (which is not as often as I'd like them to), I try to take them somewhere out of Singapore, somewhere not too far but far enough to qualify as a nested vacation. 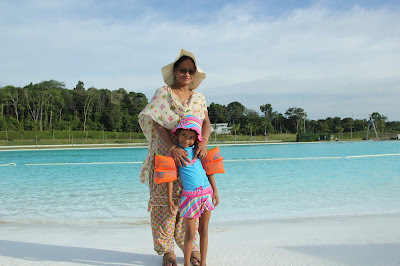 About four years ago, we had taken my mom and mom-in-law to Batam, and when my parents were here two years ago, we took them to Bali -- a vacation I'd dreamt of taking them on for a long long time. This time, I wanted to take Mom somewhere nearby for a short vacation that involved minimal walking because she can't really walk much. 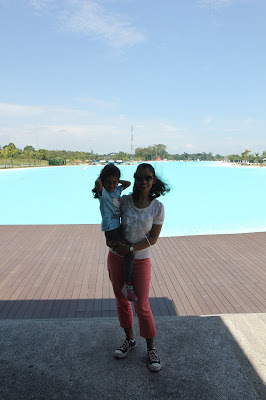 After doing some research, we decided on Bintan. 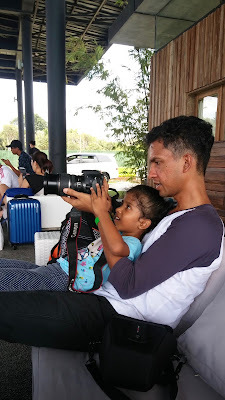 Viv and I had travelled to Bintan for our 2nd wedding anniversary seven years ago, so initially I was reluctant to go back to the same place because I hate repeating vacations. 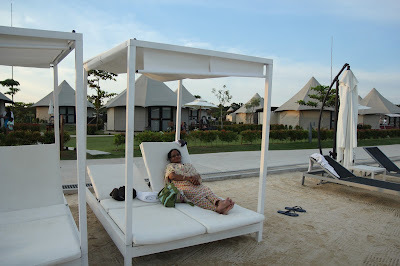 But then I found out about Canopi resort, with tents instead of rooms, and I thought Mom would like the unique concept. 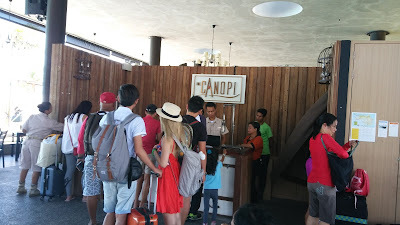 We made our bookings a little too late, which meant that the Canopi was fully booked over the weekend. 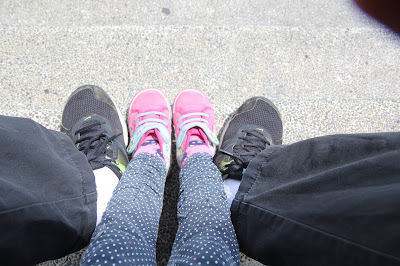 So we went in the middle of the week, though our journey started on 9th August, Singapore's National Day and a public holiday. Usually I inform Xena of any upcoming vacations only when they are absolutely confirmed. The little lady's excitement was over the top when she found out we were going to stay inside a tent! She did ask me if it would be air-conditioned, though. 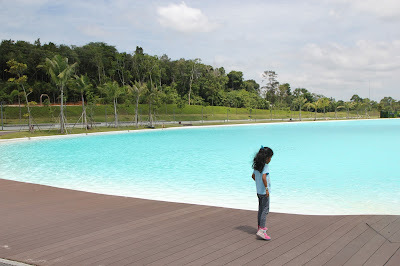 Oh, Singaporean child of mine... Well, I assured her it would be and also told her about the very cool saltwater lagoon right next to the tents where she would splash around all day if she wanted. 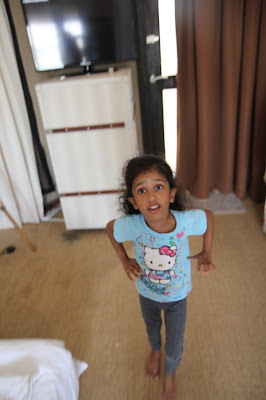 For the next few days, all we heard from her was Bintan-Bintan-Bintan and tent-tent-tent. Even her teacher and classmates had not been spared. She had even picked out the toy that was going to accompany us. The chosen one was Diny, Xena's frequently-gender-changing (she just can't make up her mind about whether it's a boy or a girl) dinosaur. I just refer to him/her as 'it' and always get (inconsistently) corrected. Finally, her our wait was over. It was the morning of National Day. Our holiday was about to start! We have started this tradition of taking a pre-trip photo just as we are about to leave on a holiday. We had a quick breakfast of maggi (!) and grabbed a taxi to the Tanah Merah ferry terminal. Our ferry was at 11.10 am. Of course, the time difference meant that we would leave at 11.10 am and also reach at 11.10 am! 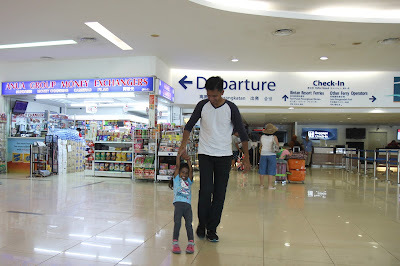 We had to wait about an hour after checking in, but father and daughter had found a way to keep themselves entertained -- ice-skating without ice! Xena wrapped Diny up in her jacket and put it to sleep in the ferry. 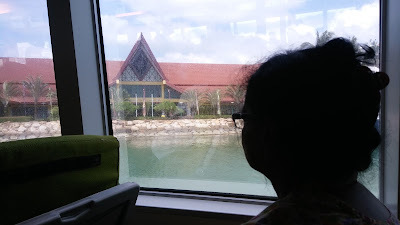 In less than an hour, we had reached Bintan's Bandar Bentan Telani ferry terminal. As soon as we reached, we were immediately ushered into a separate Canopi queue, and did not have to go through the long queue at immigration. What a surprise! It only got better. 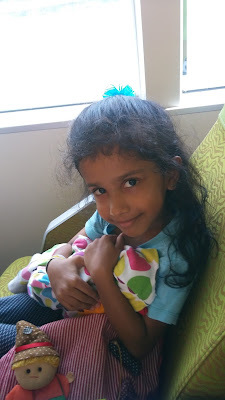 They didn't even charge us the visa fee for Mom, even though her Indian passport requires a visa-on-entry fee. It looked like everything had already been included as part of our booking. I was a bit uncomfortable at having our passports taken away, but they said they will take care of all the paperwork and stamping. Our luggage was loaded into a giant bus, and we got into it, only to alight 5 minutes later! Yes, the Canopi resort is literally 5 minutes from the ferry terminal. On the way, we did see some monkeys though, but they disappeared so fast, we couldn't show them to our own little monkey in the bus. This was the sight that greeted us as soon as we stepped into the Canopi premises. How to not fall in love?? 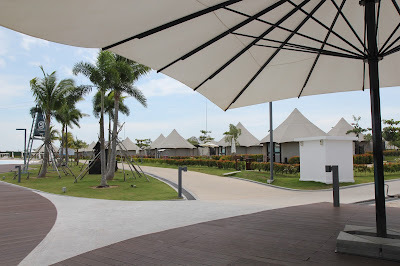 The Canopi occupies a 2-hectare site, and is right next to a 338-hectare adventure ground that includes a private mangrove river, the sea and the stunning 6.3-hectare manmade saltwater Crystal Lagoon. 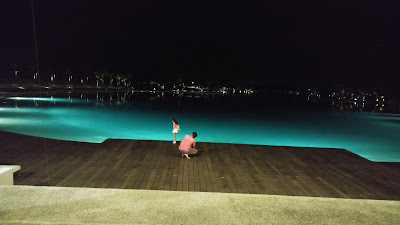 Xena was getting extremely jumpy, quite literally because the sight of the lagoon was making her want to jump in immediately. I didn't blame her for I myself wanted to do the same. 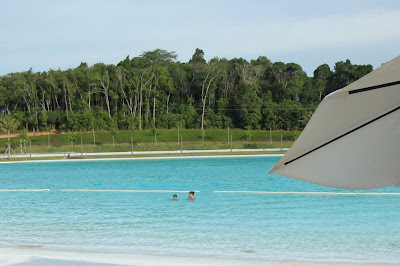 It was the most beautiful lagoon ever, with its calm waters and pristine blue colour. It was too hot to get in though, so I somehow managed to convince Xena that we would come back in the evening. It was a hot, hot day, but the lounge chairs were arranged in the shade on freshly raked sand. Check out the queue at the front desk! 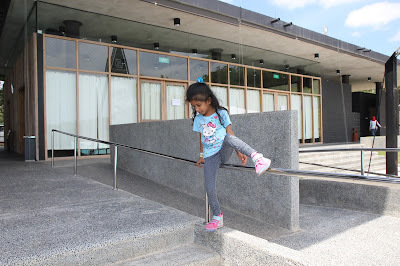 We were too early to check in, so we decided to walk around and take photos instead. The duo also attempted to take some 'artistics' shots. It was hot, but breezy, and Xena and I had a tough time controlling our crazy hair! "Mama, can I jump in now?" 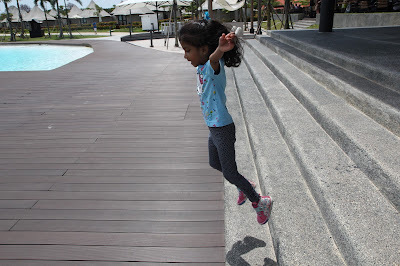 And since, the answer was 'NO', she decided to use her jumping skills elsewhere. It was almost lunchtime! It's amazing how hungry one can get on holiday without doing anything at all to deserve that meal. Bora Bora bar and restaurant is the only option at Canopi for meals, offering a mix of local and western delights. We ordered a chicken jalapeno burger, a veggie pizza and a char kway teow. Thankfully the food was quite good, especially the kway teow. The same can't be said of the drinks though. Viv and I ordered a margarita and a mojito respectively, but they were quite hopeless, watery little things. There is another meal option though, which is to have the resort arrange for your own private barbecue just outside your tent, but we couldn't imagine that being vegetarian-friendly, so we didn't opt for it. After lunch, we got possession of our tent keys. One of the staff members led us towards the tents. Which one was ours? It looked very cute -- kinda midway between a house and a tent. 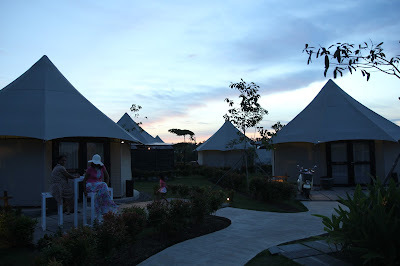 Each tent was part of a cluster of four tents, with a common barbecue area. It would be great for larger groups travelling together to book an entire cluster! My first impression of the inside of the tent? W-O-W. 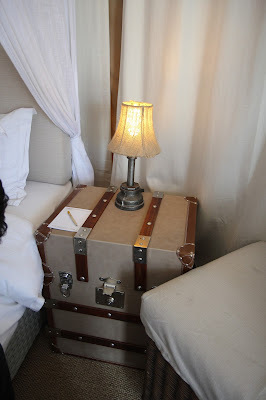 I know it was supposed to be a glamping (glamorous camping) trip, but this was too cool for a tent. 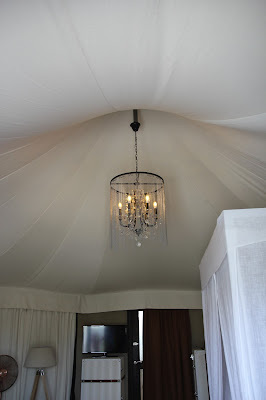 The tent even had a chandelier! 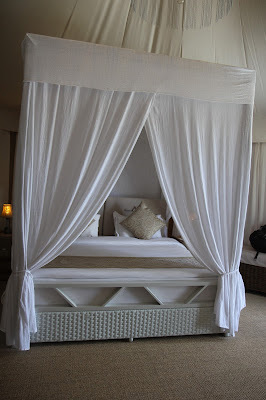 In addition to this beautiful four-poster bed, there was a couch and an extra bed. Just like the uniform of the staff, all the furniture was safari-themed. Trunk cases were used as shelves and cupboards. The bathroom was just outside the tent and wasn't exactly, erm, super-private, but what the hell. It took a while for us to get used to it though. Xena was fascinated by the bathroom. 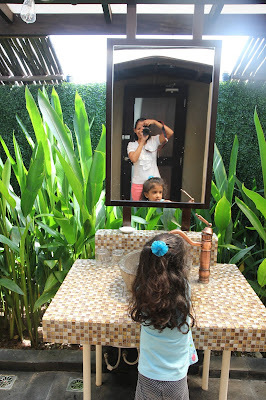 "Mama, this bathroom had big and real plants!" Xena went around inspecting everything and giving us strict instructions. "Guys, the little soap here is for washing our hands. The small towels are for for wiping our hands after washing them and the big towels are for bathing. Remember, ok?" We nodded our obedient little heads. Soon, it was time for her nap so Viv and she settled down on the extra bed, while my mom rested on the big bed. I sat up next to her, but I'm not an afternoon nap person, so I decided to sit up and make notes for Hopscotch instead. It was a nice, comfy afternoon, thought we could hear sounds of some construction nearby (building of more tents, perhaps). As soon as Xena woke up, we got ready and set off for the lagoon. The little girl was beside herself with excitement. 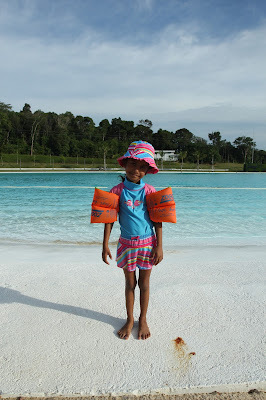 I had to literally beg her to turn around and pose before she dived into the water. 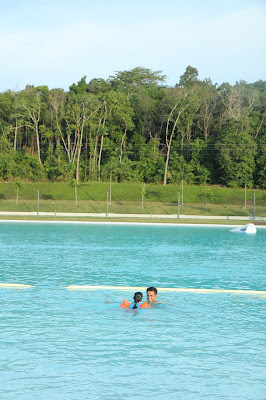 First, she and I entered the lagoon and frolicked around. The water was really salty, but unlike the open sea, the water was clean and filtered and there were no waves, so I felt safe letting Xena play as much as she wanted. 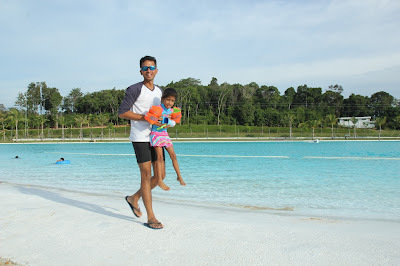 She is still learning to swim, so she wore arm floats, which made her confident enough to swim around for almost two hours! They even had a lifeguard on duty! 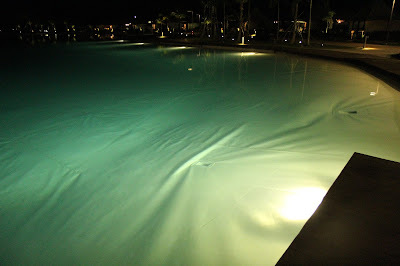 The lagoon starts off shallow at the edges, which is perfect for young children. 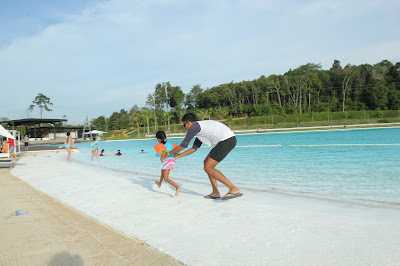 The deeper parts are used for other water activities like cable ski, stand-up paddling and kayaking, but the swimming area is clearly separated. After a while, I'd had enough. So I got out and Viv replaced me as her swim buddy. Xena's reaction to Viv's "Can I throw you up in the air?" 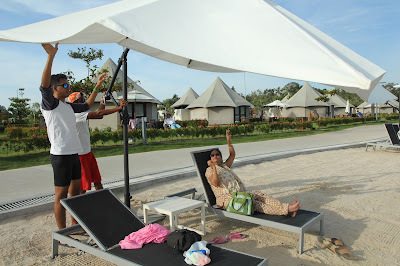 It was a windy, windy day, and the umbrella over my mom suddenly collapsed away! It was quite freaky. Fortunately, it fell away from her and not on her. The staff were quick to fix it back. But I made Mom move to a non-umbrella chair anyway. Viv finally managed to convince the unwilling Xena that it was time to get out of the lagoon. The walk back to our tent was a beautiful one. 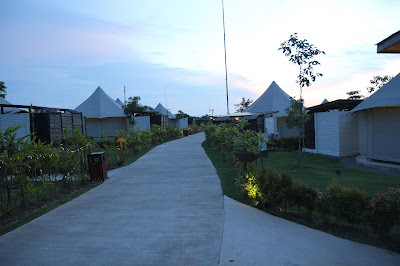 The Canopi resort has about 40 tents at the moment. 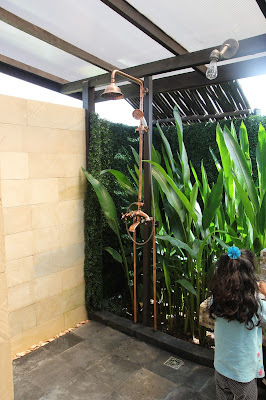 Soon, everyone had bathed and changed. There was still some time for dinner, so we sat and played Uno, which I'd taken along, just in case. Mom had never played it before and liked it so much that she was soon obsessed with it. We played multiple rounds. ...but then it got too dark, so the party had to move indoors. 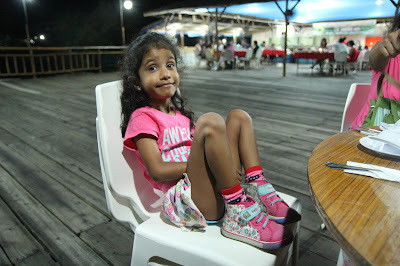 For dinner, I'd made plans for us to go to Kampung Kelong, a seafood restaurant nearby. I say nearby, but we had to take a car and then a tiny boat to get there. I captured this with my phone as we waited for the car to take us to the boat to take us to the restaurant. 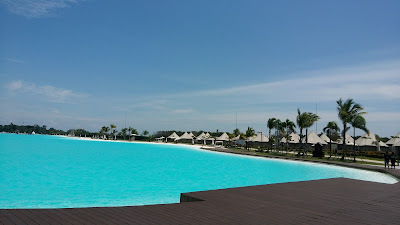 I also took another picture of the lagoon. The base looked like it was made of fabric! Soon, the car arrived and after a 5-minute ride, we'd reached the jetty. It was pitch dark when we got into the rudimentary, roofless boat, and the only sources of light were the stars and the occasional flashes of light from the boat. It was slightly scary to be honest, but quite an experience. 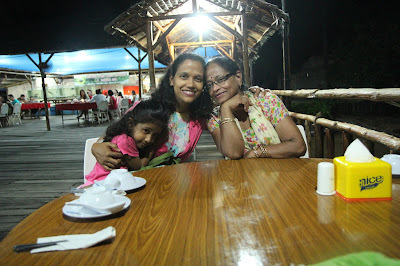 I thought I'd get a solid scolding from Mom for making her walk over rickety boards, get into a rickety boat and travel in complete darkness to some restaurant over the water, but she seemed quite thrilled. She exclaimed that she had never taken a car and then a boat just to go have a meal! 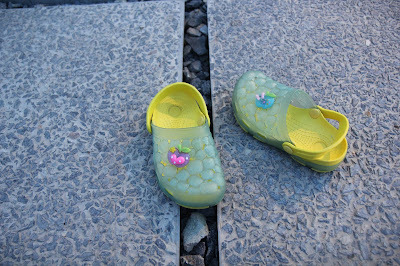 Xena had absolutely insisted on taking Diny along, so I asked her to be careful and not to drop him in the river. Terrified at that prospect, she gave him to me for safekeeping on the way back. The food was all right, but everyone had enjoyed the experience of getting there and going back. 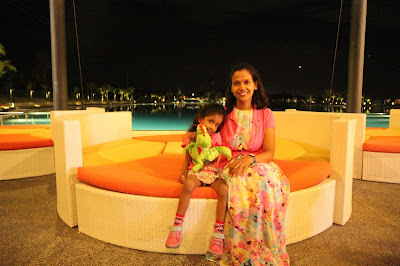 Also, clear night skies and sparkling stars are not something we get a lot of in Singapore, so dining under the stars was an amazing experience. We went back to our tent, put Xena to sleep, and then Viv and I took a walk around the place. It was breezy and beautiful and we sat at their restaurant over a beer and long island tea (which were not as bad as the drinks earlier) and talked for a while. This beautiful sight awaited us when we got back into our tents. I switched off my alarm and forbade everyone from waking me up the next morning. The tent had blackout curtains, so I could sleep as long as I wanted. The week before had been a tiring one as I'd tried to get ahead of my magazine's schedule in order not to have to work during this vacation, and I really needed to catch up on sleep. 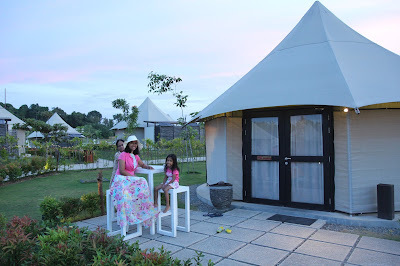 Click here for Canopi in Bintan - day 2! Hello, It was nice to read about your blog. Planning my honey moon to the canopi. Read reviews on the sites that it is overpriced w.r.t food. Can you please give me someidea about it? 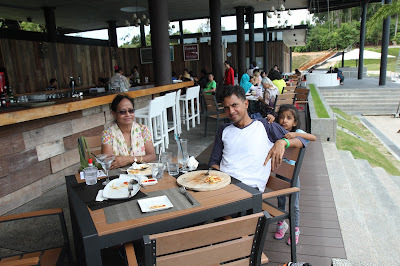 The food prices were comparable to restaurants in Singapore, so yes, it did seem a little overpriced. There weren't too many other options for food though, so we did get a little bored after the first two days. But there was some major construction happening around the area and I was hoping they'd have more cafes/restaurants. Maybe you can check on that? Okay. Will check up on that. 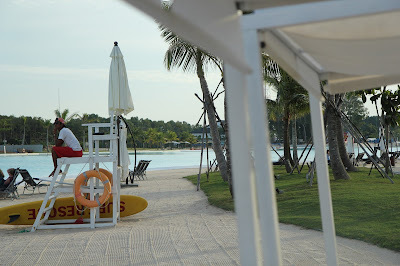 Also is there any activity to do outside the resort? 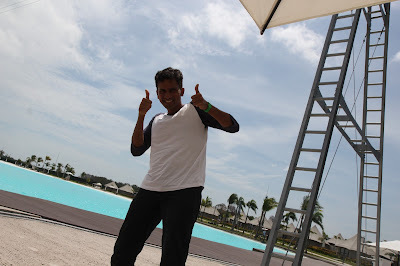 Any sight seeing in Bintan region. Do you suggest renting a car and going for a trip on the island. Planning a 3 day trip there. We didn't hire a car during either of the trips so I don't know much about that, but it does seem to be a viable option. What you could do is find some drivers using Tripadvisor etc. and ask them for recommendations on where they can take you.